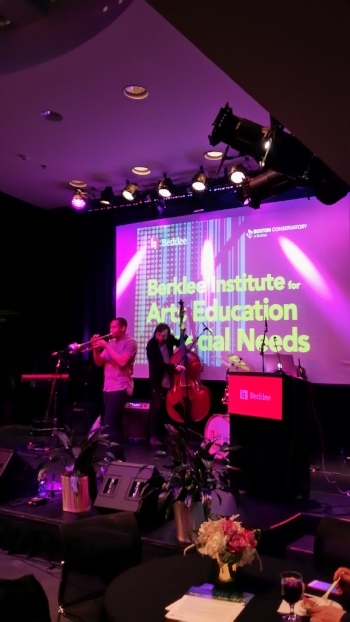 This April I went back to my old college stomping grounds, Boston, MA, to attend Berklee College's Arts Better the Lives of Everyone (ABLE) Assembly. It was a wonderful three day event hosted by the college's Institute for Arts Education and Special Needs. Really cool opening reception, which I suppose should be expected from Berklee. The band during the reception was a jazz trio composed of students from the school. The welcomes all talked a lot about the recent merge between Berklee College of Music and the Boston Conservatory, in part because the merger is what made this program possible. After the welcomes and introductions, the Merry Rockers took the stage. The Merry Rockers are a reggae band and led by Marissa "Mar" Lelogeais a Berklee Alumni and self-advocate with cerebral palsy and a visual impairment. Mar took some time on the mic to talk about what drew her to the reggae scene. She said, in particular, that it’s focus on positivity and the lyrics that uplift whether than dwell on difficulties or belittle or demean others drew her into the genre. I got a bit of a late start to the conference. I stayed out in Watertown with an old friend of mine, rather than spend the money on a hotel closer. While it was really cool to catch up with him and have a more familiar environment than a hotel to return to, I learned that proximity is really important in conference-ing. These events can be exhausting, especially as someone who has to make a conscious effort to network. They start early and tend (officially or unofficially) run late, so being able to wake up and walk right over to the venue makes a big difference. I started this day off with a session on movement entitled “Meaningful Movement in the Classroom: Techniques and Activities to Deepen Learning and Increase Engagement” led by Portia Abernathy the Director of Programs at VSA Massachusetts. The workshop was really well done and offered a lot of actionable ideas for classrooms big and small. One of my favorites was the “Flock” activity: the group, probably around 40 people, was broken into smaller groups of 4-6 each with their own set of movement guidelines. The person at the point of the small group was the leader and the others had to follow their movement until it was passed onto the next member. This process continuing all the way around the group. Over the course of the activity, these small groups joined one another until all of the attendees were moving together. It was a fascinating activity that really required concentration and attention to one another, something Abernathy pointed out at the start, as we had to be aware of the shifts and follow whoever becomes the new leader. Also, the feeling of that leader position shifting to me was intense! There was something very moving (no pun intended) about knowing that 40 other people, in this instance complete strangers, were following my lead. I can see how students could really bloom after having that kind of an experience. Lunch was free, but hosted at the Berklee College dining hall. While I’m certainly never one to complain about free food, and especially fresh, good, free food, it felt a little off putting and to be thrust into that setting. Maybe that’s due in part to my own experience as an undergraduate in Boston rolling out of bed to meet up with friends and eat away all those late nights studying. After lunch I had my workshop. Working on the audio and visual stuff with Berklee sound folks was pretty awesome! Tom (the guy in charge of my stage) was really kind and accommodating and I’m grateful for his patience during my set up! Having a session slot right after lunch is always a little tricky. People are usually a bit late, and a bit sleepy, but the group I had was amazing. I had a small, but devoted crew! I had about 10 people, which really was the perfect size for the activity I had in mind, and all of them seemed really interested in and committed to learning about my work. During the model workshop/ collaborative writing portion they were really together and we made a lovely little poem based on my wishful Spring prompt. “April Showers / bring Mayflowers” is written in black lettering on a white board. Below that in a vertical column are note cards. It’s clear that there’s writing on the cards, but the writing itself is illegible in the photo. In a classroom with a brown rug, desks, and tiled, white ceiling Jonathan Mende, a younger black male in a black suit, red tie, and glasses, presents to an audience, his hands out stretched emphatically. Behind him is a colorful slide and around him is a table with computer. Below this table is an amplifier, plugged in, with a white mesh front. After these sessions, I caught the tail end of Sheila Scott’s “Vocal Activities for Children with Autism Spectrum Disorder.” When I walked in she was playing a kazoo which, while not my cup of tea, I can certainly see younger children really responding to and finding some enjoyment in. I’ve been making a conscious effort to take time and enjoy the cities I travel to, for example in Austin I took time to hike the Greenbelt, so I decided to hang out with my friend and visit Boston’s Museum of Fine Arts. The Boston MFA is one of all-time favorite museums. As a college student I was able to get in for free, so I ended up spending a lot of afternoons and evenings wandering around and taking in the artwork. The Takashi Murakami exhibit had just closed on April 1st which I was really bummed about! I’m hoping that it makes it’s way to NYC soon, but I was able to catch a little sneak peak of it as the museum was still in the process of taking it down. I was excited to see their other special exhibit though: the sketches of Klimt and Schiele: Drawn which was a cool look at the early work of Klimt and introduced me to Schiele’s work which I had never seen before. I also paid a visit to the reconstructed Buddhist temple the museum hosts and, along the way, was really taken by another rotating display they had of Japanese psychedelic art from the 1970s. The illustrations of Takeda Hideo held my attention in particular and it was fascinating seeing the ways in which Japanese artist responded to the Zeitgiest of that era because the American imagery is so recognizable. After that, a trip to a favorite coffee shop in Brighton and a quiet dinner with some friends closed out my trip. I’m always charmed anew by the city of Boston. While I’m not sure I'd want to live there again, I can say for certain I’m excited for a return visit.